The XRP7714 is a quad-output pulse-width modulated (PWM) step-down DC-DC controller with a built-in LDO for standby power and GPIOs. The device provides a complete power management solution in one IC and is fully programmable via an I2C serial interface. Independent Digital Pulse Width Modulator (DPWM) channels regulate output voltages and provide all required protection functions such as current limiting and over-voltage protection. Each output voltage can be programmed from 0.9V to 5.1V without the need of an external voltage divider. The wide range of the programmable DPWM switching frequency (from 300 KHz to 1.5 MHz) enables the user to optimize between efficiency and component size. Input voltage range is from 4.75V to 25V. An I2C bus interface is provided to program the IC as well as to communicate with the host for fault reporting and handling, power rail parameters monitoring, etc. 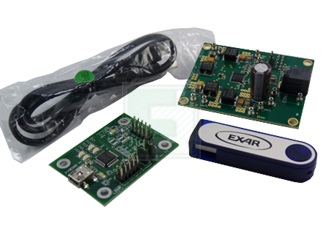 The device offers a complete solution including independently programmable: soft-start, soft-stop, start-up delay and ramp of each PWM regulator.